This 24" x 30" floor mat will change colors with the touch of hands or feet. Leave your tracks all over the place and have some creative fun with this super cool color changing floor mat. Ages 3 and up. 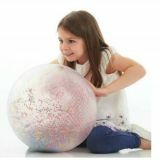 A large clear inflatable ball with a subtle textured surface, containing thousands of tiny colorful plastic beads which rattle and dance as the ball is pushed and rolled about. Inflation needle included. Measures 12.2" in diameter. Infant and up. This tennis sized ball is filled with soft cut straws, giving it a totally unique fell. 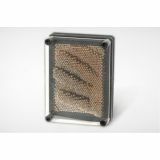 It is irresistible to squeeze and every time you do, you get a distinct crunching sound and feel. 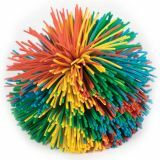 Super soft and safe 3" multicoloured coosh ball. 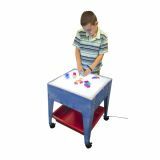 Great for play and sensory work. Contains 9 pairs of differently tactile colourful balls in a black feely bag. The bag has a soft, velvet touch finish with fold over top and is machine washable. Includes activity guide in 7 languages. Size of balls: approx. 55mm dia. Size of bag: 340 x 300mm. Ages 12 months and up. 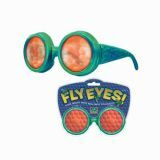 Explore your world through Fly Eyes! Each faceted lens on these unique glasses rotates to produce a fantastic kaleidoscopic effect. 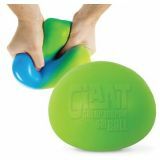 Filled with water beads, squeeze it, and the beads glide through your fingers for a super satisfying sensory experience. Ages 8 and up. 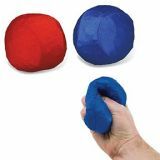 A large stress ball filled with super soft gel. Give it a good squeeze and watch the skin appear to change color. Ages 8 and up. With the included remote the light color can be set to white in addition to several other colors. 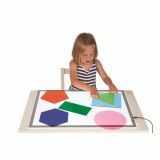 Children will be able to experience how light color interacts with other colored manipulatives (not included). 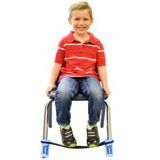 Four EZ-Roll 2” casters for easy mobility, or lock for stability. Sturdy and colorful molded construction of certified non-toxic resins. Create 3-D pin art in seconds by pushing against the metal pins. Ages 6 and up. Giant acrylic shapes in different colours. Circle measures 7.9" in diameter. Accessories not included.